They say a man never really knows himself... until his freedom's been taken away. I wonder... how well do you know yourself? Convict 626. Murderer. Pirate. Traitor. Today... you go free. But as you'll soon learn... even freedom has a price. You'll carry your prison with you. That armor will be your new cell. Make no mistake... War is coming. With all its glory... and all its horror. Mr. Findlay - your freedom awaits. I found Aleifir a bit hard to find. I thought he was up the mountain somewhere but he is actually in a cave east, around the corner, on the same level as the other drakes. Well, dumb me apparently didn't go the right way for turn in. Will I have to do the quest again? I can't seem to get to the turn in location. 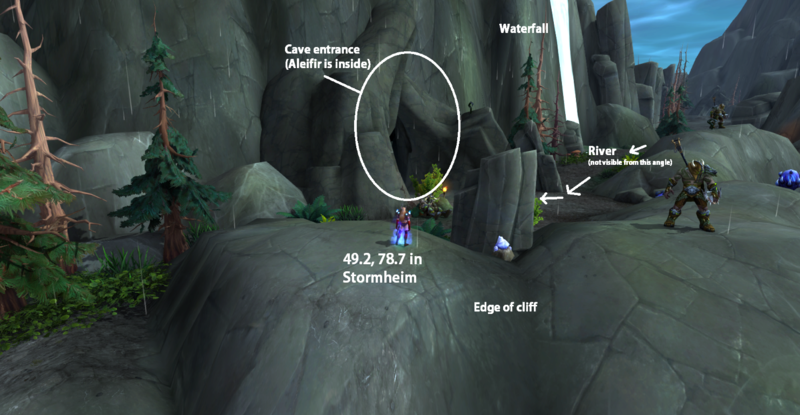 As stated above, Aleifir is inside a cave, not at a different level from the rest of the quest. 2. After crossing the river, you will see the cave entrance at the side of the mountain (image here). 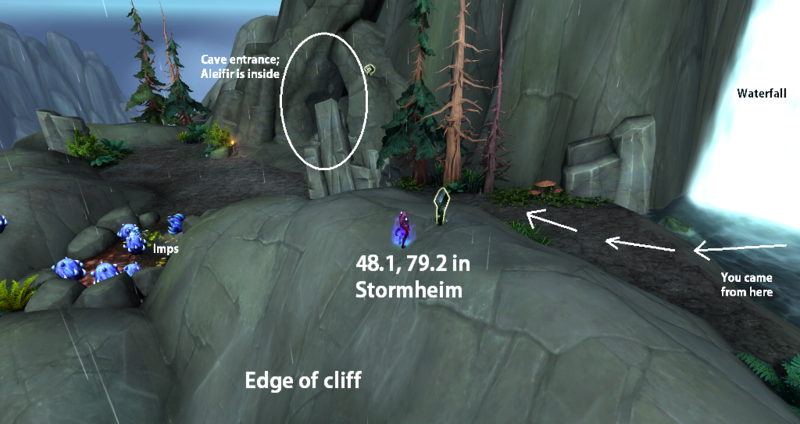 In this image I'm standing at 48.1, 79.2 in Stormheim. 3. Just another view of the cave entrance from a different angle (image here). 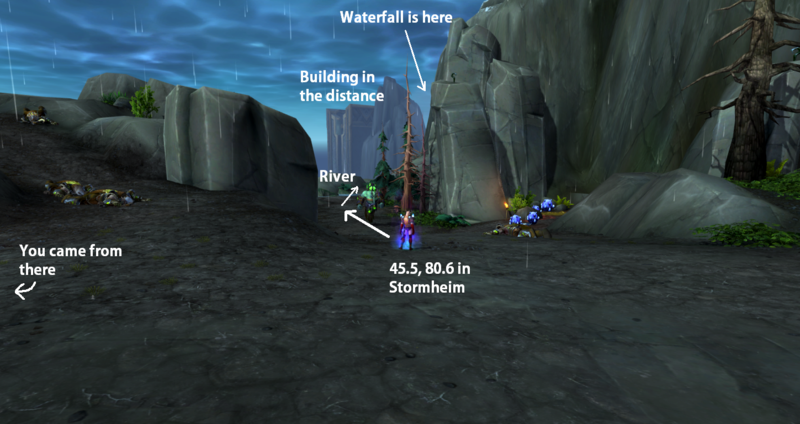 In this image I'm standing at 49.2, 78.7 in Stormheim. From Dreadwake's Landing, turn SE and travel to 57.5, 78.8 for the start of the trail up the mountain. Your next trailhead starts at 51.8, 76.1. Follow this to the split in the trail at 50.7, 76.6. Turn right. Continue thru the switchbacks thru the Stormwing Rookery, to the next split at 49.5, 72.8, turn left this time. Continue to the broken bridge that you grapple across at 48.1, 76.8. At 44.3, 75.4 you'll need to grapple up to the ledge above you; you are now directly above Hrydshal. At 44.9, 77.9 you'll need to grapple across a broken bridge again. And Voila! You're at Thorim's Peak. Fly to Lorna's Watch and talk to the big blue dragon if you are trying to figure out how to get to quest giver. I stopped mid quest and did a heroic and spent 3 hours trying to figure out how to get back to the top of the mountain. Surprised to see no one's mentioned that this is a Starcraft 2 reference. Mind the gap right there ! This appears to be bugged at the moment. I found the other drakes and freed them, and found Aleifir and killed the mob next to him. The drake said he was free and went through the dialog for the quest being completed, but I never got credit for it. I abandoned the quest and tried again and Aleifir never spawned again. Liberte Aleifir, Hrafsir, Erilar e Hridmogir no Pico de Thorim. Quando os Vilscárnio atacaram o ninho, os Thorignir lutaram bravamente para salvar nossa raça. Mas os aliados demoníacos deles eram fortes demais, e muitos dos nossos foram capturados. Neste exato instante, eles estão tentando corromper meus irmãos para que passem para o seu lado. Por favor, forasteir<o/a>, liberte-os dessa sina! Eu estou em dívida com você por isso. Meus irmãos não conseguiram se defender dos Vilscárnio e teriam terminado como escravos. Você é um verdadeiro amigo dos Thorignir.